In a thriller to the finish, the New Orleans Saints held off the visiting Carolina Panthers to advance to the Divisional Round of the playoffs. Quarterback Drew Brees got off to a hot start early in the contest and never seemed to cool off, as he led the Saints to a 31-26 win with his 376 passing yards and two touchdowns. 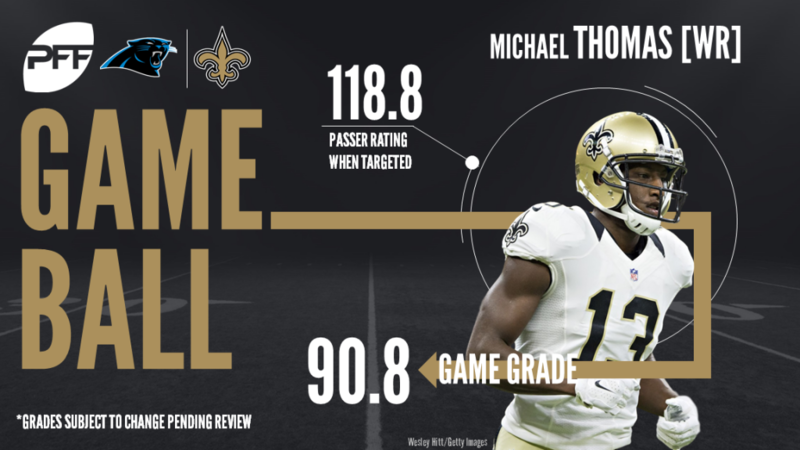 Brees’ go-to target Michael Thomas also put on a show in his postseason debut, hauling in 8-of-9 targets for a team-high 131 yards on the day. Though unable to match Brees stride for stride, Panthers quarterback Cam Newton put forth a valiant effort to keep his team within arm’s reach into the final seconds. He completed 24-of-40 passes for 349 yards and two touchdowns. Thomas continued his stellar season, catching eight passes for a season-high 131 yards. Six of those went for first downs, and his 46-yard catch tied the longest of his two-year career. Brees threw the ball exceptionally well, hitting on a few deep passes and back-shoulder throws. He completed 10-of-15 passes targeted 10-plus yards downfield for 250 yards. His offensive line certainly helped him out, as he was pressured just 23 percent of his dropbacks, the lowest of any quarterback in the Wild Card round this weekend. Jordan was a terror all game, both setting the edge against the Panthers’ outside zone running schemes and getting after the passer. Jordan turned it on when it was needed on crucial downs, finishing the game with two sacks, one hit, two hurries and two batted passes at the line of scrimmage. Jordan’s 89.3 run-defense grade was the best by a Saints defender by a good margin. Lattimore was on lockdown once again, consistently manning up Panthers WR Devin Funchess and forcing pinpoint throws from Newton. Lattimore surrendered just one pass completion for 19 yards on four targets and also had a pass defensed. Newton played one of his best games of the season, firing a number of accurate throws in tight coverage. Newton was on the bad end of some dropped passes, with three total on the day including a would-be touchdown to Kailen Clay in the first quarter. He did most of his damage at the intermediate level of the field, finishing 10-of-12 for 162 yards and a touchdown on throws traveling 10-19 yards in the air. As it has been for much of the season, McCaffrey was held in check in the running game but was a big part of Newton’s success through the air. McCaffrey provided the biggest play of the day for the Panthers, exploiting a mismatch on linebacker Craig Robertson in the middle of the field and bursting for a 56-yard score. McCaffrey finished the day hauling in all six of his targets for 101 yards and the touchdown. The Panthers held the Saints’ rushing attack in check, and Short was a significant part of that with his team-high three run stops. He had two pressures in the game, and got his lone sack when he bull rushed Larry Warford right into the quarterback. It was a rough night for Bradberry, who allowed six catches for 72 yards and a passer rating of 109.5 into his coverage, with all but one catch picking up first downs.